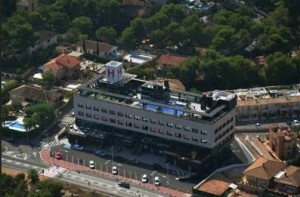 It offers a gym, spa and superb views over Torrevieja Lagoon from the rooftop pool and chill out terrace. Modern air-conditioned rooms have free Wi-Fi, a flat-screen TV, safe and minibar. The private bathroom comes with a hairdryer, and some have a spa bath. Some rooms offer lagoon views. This air-conditioned house has 4 double bedrooms, 2 twin bedrooms, and 2 bathrooms with a bath or shower, and hairdryer. Bed linen and towels are provided, and a washing machine is available. There is a living space with a fireplace, sofa, flat-screen TV with satellite channels, and dining table, while the kitchen is equipped with a dishwasher, oven, fridge, coffee machine, electric kettle, and toaster. You can find a restaurant, bar, and grocery shop within 1 km of Holiday home Los Balcones. The nearest beach is a 5-minute drive away. It has a private roof terrace on the second floor. The front terrace enjoys a view of the swimming pool and the coast. The pool is shared with twenty-four other holiday accommodations. The roof terrace has a delightful view of the mountains, the countryside and the surrounding citrus plantations. You only have to drive three kilometres to the sandy beach at Orihuela Costa for a wonderful day at the sea. You ll find shopping centres, good restaurants and eighteen-hole golf courses. such as Villamartin and Campoamor, in the vicinity. Elche. city of palms. is 50 km away. The historic cities of Alicante and Murcia are well worth a visit. You can also discover authentic Spanish villages and enjoy delightful cycling and walking trips. 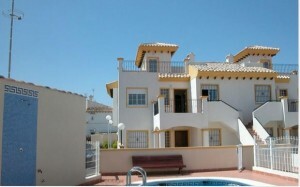 The urbanisation of Los Balcones, is built on the slopes of the “Saline De Torrevieja”. This salt lake is a “Parc Natural”, a protected wildlife area. The algae in the water gives the lake a pinkish tinge at certain times of the year. Four roundabouts control traffic through the urbanisation. Just 10 minutes walk from Balneario IV, is the Los Balcones shopping plaza. On the corner of the roundabout is a kiosk, selling tobacco, and multi language newspapers. There is a medium sized, well stocked, supermarket, selling the majority of your daily needs. At the corner of the plaza, is a branch of the local CAM bank, with a cash machine. Within the plaza itself are many cafes, restaurants, and bars. What better way to spend a relaxing morning, than strolling to the plaza, buying a newspaper, and chatting over a coffee, in one of the cafes. From the supermarket, choose something for lunch, and stroll back to the apartments, for a refreshing swim. The harbour town of Torrevieja, dates from Roman times, however the present town was rebuilt in 1860. The main industries are tourism, salt exports, and fishing. With a population of some 81000, doubling in the height of the season, the town becomes quite busy, but never uncomfortably so. Generally it is a friendly cosmopolitan town, with plenty of bars, cafes, and restaurants. The main airports of Alicante, (El Altet) to the north, and Murcia (San Javier) to the south, are about 37 kms distant. In the evenings, stroll along the front, and look at the craft stalls. Our favourite stroll is the boardwalk at La Mata, usually about 10 in the evening, all the locals are out and about, chatting and walking, just enjoying the evening air. Orihuela – is a must for culture vultures, this is old Spain at its best. Lots of lovely old cathedrals, and palaces to look around. Elche – is world renowned for having the largest date palm groves outside of Africa. See them at the Municipal Gardens, or the Huerto del Cura. Wildlife -This low lying area adjoining the sea has many salt lagoons, and marshy wetlands. The conservation area has many “Parc Naturals”, where the birdlife is protected. View the flamingos, and experience the peace at La Mata, or El Fondo visitor centres. Golf – The Real Club Golf Campoamor is a magnificent residential and tourist complex one of Spain’s most popular and upmarket holiday destinations. For the discerning golfer, there are two excellent neighbouring 18 hole courses at Villamartin and Las Ramblas, with the world renowned La Manga only 30 mins away.